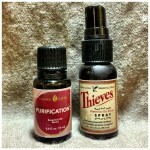 Last November Thieves Oil saved me in four hour’s time from a cold/flu that was coming on with a vengeance. The next day I enrolled as a Wholesale Member of Young Living Oils. Like a lot of people, I want a higher vibration quality of living in my body and home. I’ve always been paranoid about toxic home cleaning products, overuse of OTC drugs and pharmaceuticals, and chemicals in personal care products. I am always seeking out alternatives. This first-hand experience (when I was spared a real nasty sickness by using Thieves Oil) of the ‘power of the flower’ and the natural healing remedies is what essentially ‘sold’ me on the products. Young Living products satisfy a full spectrum of my needs from aromatherapy, personal care, nutrition, and supplements. Incorporating Young Living into my daily routines of mindful movement, self-care, and home maintenance have brightened up my world with an elevated sense of consciousness about vibrant healthy living. And everything SMELLS. SO. GOOD. I’d love to share the oils and other products with you. Please contact me for a consultation, demonstration, or small seminar. You can reach me via email at melanie@yogabirds.com or via text or voice mail at 251-508-7099. If you’d like to enroll as a Wholesale Member to receive significant discount (24%) on oils and other Young Living Products, please enroll through my sponsorship. It is very simple to do at my Young Living Website (www.youngliving.com/yogabirds). If you sign up at the main Young Living site, please use my member #1572095 as the Enroller and Sponsor ID. Please be in touch if I can answer ANY questions for you.